Protected from light rain by hastily assembled canopies, about six dozen people gathered at the entrance to Riverwood Park on Wednesday, October 3, 2018, to dedicate La Verkin's newest park to the memories of Jada Marie Harris and Steven W. Cox. Along with the Harris and Cox families the crowd included La Verkin's Mayor and Council, most of the city employees, and representatives of other emergency response teams. Many La Verkin families came with their children, who lightened spirits a great deal. Jada Harris was only two years old when she disappeared on August 1, 2012. After an intense search by all local city and county response teams, assisted by hundreds of volunteers, her body was found in La Verkin Creek under the State Route 17 bridge above this park. Responding to an emotional reaction by the community, four months later the La Verkin City Council resolved to establish a memorial park. 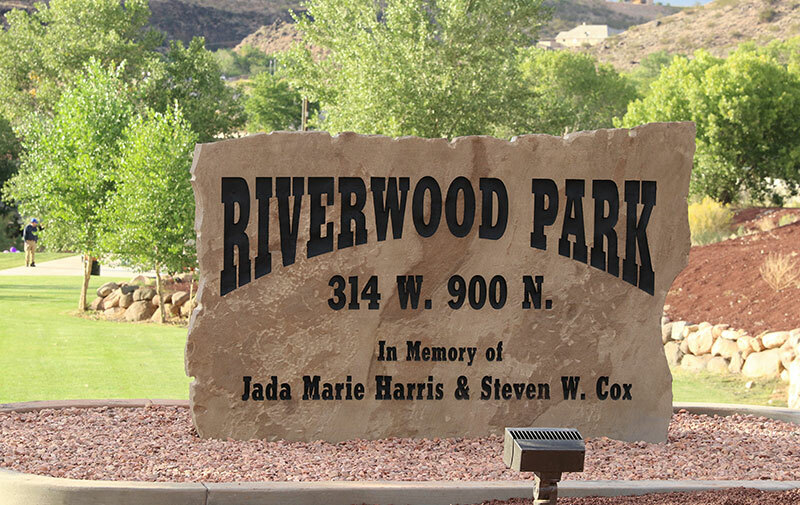 It was fitting that they sited the park in the grassy area at the entrance to Riverwood, near the spot where Jada was found. On January 3, 2017, Steven Cox, a 20-year employee of Hurricane City Public Works, was marking a water line here when he was struck and killed by a rotating backhoe. Cox was a well-known local man. He lived in Rockville most of his life. His death left a hole in the community, and his name was added to the memorial. The event began as Mayor Richard M. Hirschi introduced relatives of Jada and Steven. They described their losses and expressed gratitude for the community's support. They made a point of thanking city and county emergency response personnel for their help at the time of these incidents and their support ever since. 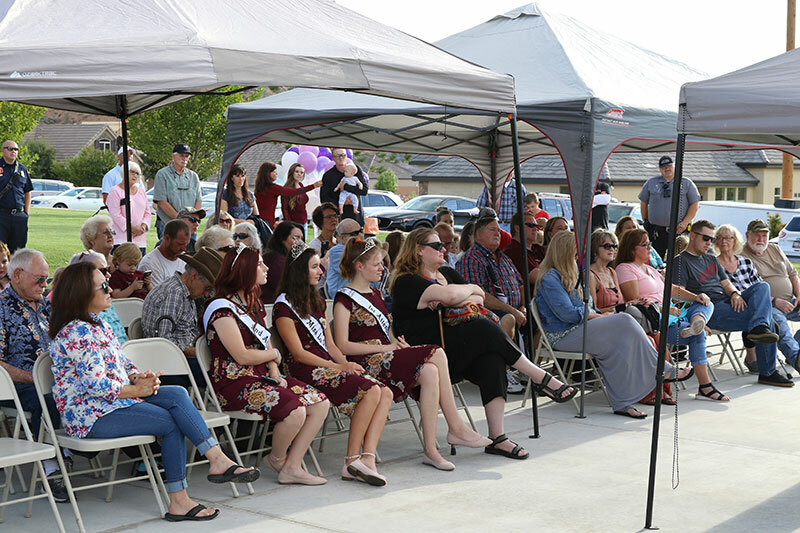 Steven's brother Tracy Cox gave an invocation filled with gratitude, followed by words from Jada's father Steven Harris and Steven Cox's son Colten Cox and sister Jacki Cox Wells. 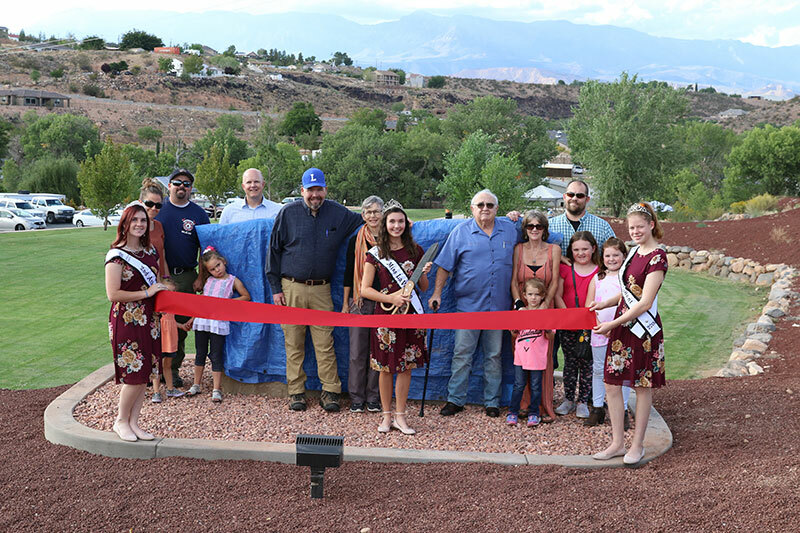 Mayor Hirschi thanked everyone and invited the crowd to move up the hill to the roadside where Miss La Verkin (Gabriela Homer) and her attendants, Melody Smith & Kimberly Farrar, performed the ribbon cutting. As the sign was unveiled, the sun burst through the clouds, adding a sense of uplift to end the ceremony. The city provided refreshments, (The children dove for those cookies!) and the event finished with a social gathering on the new concrete pad where a gazebo is planned, and down in the contemplation nook, tucked away just above LaVerkin Creek at the north end of the park. Steven's and Jada's names are worked into the backs of two cast iron contemplation benches in this nook, a reminder for those who come here. Steve Harris, (not Jada's father, just a coincidence that they have the same name) who works for Scholzen Products in Hurricane, is responsible for the special benches.